To give the swimming pool noodle an oval shape, thread the yarn or string through the hole by attaching it to a wooden skewer. Simply slide the skewer down the noodle. Once the yarn or string is sticking out of both ends of the noodle, remove the skewer. Bend the noodle and knot both ends of the yarn or string together to create a basketball net. Use the ends of the yarn or string to hang your basketball net from an outdoor play structure, a tree branch, your clothesline, or your gazebo. By adjusting the length of the yarn or string, the basketball net can easily be raised or lowered to adapt the game for children of all ages. If younger children are tempted to pull on the noodle, use elastic fabric to hang your basketball net. Once your basketball net is ready, simply deposit balls next to it. 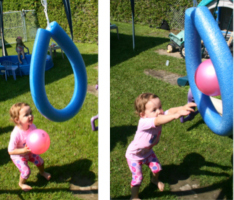 Children will be drawn to the balls and immediately try to toss them through the hoop. If you wish, you can prepare several basketball nets and hang them here and there throughout your yard. With older children, you can introduce a simple point system. For example, you can tell them that successfully tossing the ball through the red hoop is worth 1 point while tossing the ball through the blue hoop is worth 2 points. 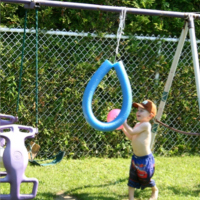 You may also encourage children to try to throw the balls into the hoops while standing at different distances from their target.